This is the second guest post from Rich Jones, who previously shared some ramblings on his place of employment, an antique store (what’s the big deal with Charles Bukowski?). Here he offers a few brief episodes from his aimlessly misspent youth in San Francisco in the late 60s/early 70s—which back then was probably the best city in the world in which to aimlessly misspend one’s youth. They may remind you of the old adage God watches out for drunks and fools. When I was thirteen, I got my first job delivering the morning paper with a couple of school chums, brothers who dealt marijuana on the side and paid me a lid per month instead of cash to help them with the route. I’d get up at 3:00am and bike to the corner where the distributor dumped the papers; then the three of us would sit around inserting adverts and folding and loading the papers into a canvas shoulder bag while smoking dope. We’d hit the pavement by around 4:00am. We delivered papers in one of the tonier neighborhoods in San Franciso—Presidio Heights—which includes a gated cul-de-sac, Presidio Terrace, on Arguello Boulevard. Among others, it was home to then Mayor Joseph Alioto and then Supervisor, now Senator, Diane Feinstein. We had to go door-to-door once a month to collect the subscription fees. Oddly enough, the greatest concentration of deadbeat accounts, those who “paid by mail,” but in fact didn’t pay at all, was within the Terrace. Eventually, the brothers got tired of the paper route, so I took it over as a sort of sub-contractor, still working for marijuana. I really enjoyed that job; I liked the deserted streets, the cool morning air, the walking around, and of course, the dope smoking. Unfortunately, I lost it after about a year when the paper consolidated routes and began requiring car ownership for delivery people. But it was fun while it lasted. One evening, some of my friends and I were out there drinking beer and smoking pot, when I felt the call of nature, got up, and staggered downhill. Coming around a bush, I suddenly found myself treading air and plummeting down the cliff face, too drunk to be scared until I was well on my way. I was wearing a three-quarter-length leather jacket I’d scored at a thrift store only weeks before, which kept me from shredding my back against the rocky shale as I slid down. As luck would have it, the tide was coming in, and I landed up to my knees in partially liquefied beach sand. The sand was like glue, and the only way I could move was to step out of the pair of knee-high suede cowboy boots I’d spent several months of odd job wages on (earned in the underground economy of the time) at a surplus store on Market Street. Totally shaken and scared witless, I half crawled, half waded through frigid, knee-deep water to China Beach, weighed down by my wet clothes and the leather jacket. 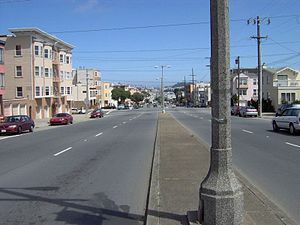 From there, I managed to walk from 28th Avenue to 10th Avenue and Anza Street in wet woolen boot socks, raising a set of blisters the size of Kennedy half-dollars on the soles of my feet. Thanks to the cold sea water, adrenaline pumped into me during the fall, and the long walk home, I was stone cold sober when I got to the front door; thus, I managed to sneak to my room, avoiding embarrassing parental inquiries. When I saw my friends at school the next day, they all swore they’d been completely unaware that I was missing. While nominally attending high school, my wiseacre friends and I spent much of our time hanging out in an area known as “the Pit,” which was located under the western side of the concrete stands of the football stadium. The Pit had restrooms that were kept locked except for game days and a windowless utility/storage room where the groundskeeper, whom we all called “Jack T. Gardener,” kept his equipment. Jack was pretty cool. He would unlock the restroom when we had a quorum and didn’t report us when we smoked cigarettes or drank beer there. He even kept some softball equipment for the impromptu games we held in the early afternoons when we were buzzed and mellow. In exchange, we kept the Pit cleaned up and carried our empties off campus so he wouldn’t get into trouble when the boys’ dean, who shared a last name with Sherlock Holmes’ nemesis, came snooping around. My best friend, Ed Chung, was part of this group. One day while the two of us were wandering stoned and happy down Clement Street, we found a box of plastic sunglasses in the trash outside the now long gone Owl Drugstore. Their frames were of various styles but all of the same rather unattractive shade of blue (probably why they were being thrown out). We took them over to the Old Man Shack where seniors played checkers and smoked themselves to their graves in Mountain Lake Park and sorted them out. In the process, I discovered I could wear two pairs at once, with the second pair resting atop the first so I looked like I had four eyes. Ed tried on two pair as well, and we both laughed till our sides ached. Then Ed thought up a stunt we could pull, which he organized and we carried out that very evening. Around 8:00pm, Ed, his older brother, Ray, our friend Chris, and I all met at a tennis court off 25th Avenue and smoked a joint. We then walked out to four bus stops westbound along the 1 California Electric Line and spaced ourselves one stop apart, between 25th and 32nd Avenues, where the line turns south at Lincoln Park to loop back towards downtown. Each of us was wearing two pairs of blue framed sunglasses, one pair atop the other. The bus, with only a few passengers, stopped for each of us. We got on, paid our fares, and seated ourselves from front to rear. When the bus arrived at the 33rd Avenue turn-around, we all got off. The driver didn’t say a word, but he definitely gave us the fish eye. We managed to get through this stunt without cracking up on the bus. Afterward, we headed to Eagle Point to smoke more dope. There used to be an ice vending machine at a Union 76 service station located on Geary Boulevard at Stanyan Street. For, as I recall, a dollar you could get either large bags of crushed ice or solid 12×12 ice blocks. The doors through which the ice was dispensed were large enough for a slender teenager to crawl through. So we’d climb in and steal blocks of ice and then haul them the six blocks over to the Presidio Golf Course via Arguello. Along the way, we’d scrounge copies of the throw-away newspaper The San Francisco Progress which typically accumulated unread on front porches and in the vestibules of flats and apartment buildings. The Presidio Golf Course had a hill to the west, just past the clubhouse near the Arguello Street Gate, that sloped steeply and dramatically down towards Mountain Lake Park. We’d take the ice blocks up to the crest of the green, put the pilfered newspapers on top of them, and then ride them down the manicured hill—typically stoned out of our minds. When pursued by the MPs, which was frequently, we’d escape by crossing a deep, concrete culvert that ran parallel to the hill and was choked with blackberry bushes. After crawling under a chain-link fence and scarpering for the nearby park exit at 6th Avenue, we escaped onto Lake Street, scratched and bleeding, but free. We never once got caught.